Rowman & Littlefield Publishers, 9781442220508, 198pp. The last time you went to your doctor, you might have emerged feeling dissatisfied and disoriented. Nothing was clear after you left the office, and you don't know whether it's your fault or the doctor's. But that's beside the point: the important thing is to identify the problem at the root of this experience and take steps to change it. Talking to Your Doctor helps readers navigate the new, more promising waters of doctor-patient collaboration, starting at the simplest and most human interaction--the conversation between two people in a room--and ending with the benefits that can be obtained by cultivating an effective partnership. While patients need to take control of the visit and set their agenda, the latest research shows that doctors and patients need to connect on a more emotional level as well. In Talking to Your Doctor, readers will: -Learn how to talk to your doctor--and get your doctor to talk to you -Discover the science of doctor-patient communication and its relevance to the lay public -Remake the relationship with your doctor, and our health care system, on the basis of good communication -Make sure your visit with the doctor is productive and meets your needs -Help yourself and others avoid over-testing and over-treatment Starting with the conversation can redress imbalances and put the relationship of doctor and patient, and eventually the entire health care system, back on a healthy footing. 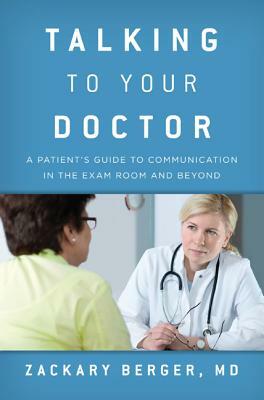 Using illuminating model dialogues, real transcripts from the clinic and hospital, resources for communication improvement, and a brief history of doctor-patient communication, the author helps readers develop strategies for obtaining better care from their doctors, from the minute they step into the exam room. Zackary Berger, MD, is a primary care doctor and internist as well as an epidemiologist. He is an assistant professor at the Johns Hopkins School of Medicine, where he maintains an active practice in adult medicine and teaches with residents and medical students. His research on doctor-patient communication, bioethics, and clinical epidemiology has been published in the Annals of Internal Medicine and the Journal of General Internal Medicine, as well as in numerous venues for the general public.